Workforce Optimization « Global Market Insights, Inc.
Owing to the increased focus on customer service and digitization of processes across numerous industry sectors, the contact center software market registered revenue worth USD 14 billion in 2017, driven by the demand for efficient customer handling solutions. Massive investments have been made by companies to upgrade contact centers to more productive and cost-effective software-based facilities for coordinating services among different channels. This has eventually allowed many emerging technology companies to tap into the services sector. Increasing adoption of online services by BFSI, telecom and hospitality consumers has transformed the contact center software industry with the need for ensuring quick and accurate responses. Rising consumer spending on electronics, clothing and other product categories has tremendously bolstered the retail segment worldwide, propelling the contact center software market revenue globally. Reports show that consumers rate customer service in retail sector higher than low prices and product quality, making it the most important part of the businesses retailers should be focusing on. Good customer service leads to more recommendation from consumers, which directly boosts product sales. Subsequently, retail is an ideal application base for the contact center software market, helping companies provide timely and dedicated service for taking care of any problems the customers communicate. Major retail brands have employed contact centers to handle hundreds to thousands of queries, frequently asked questions and complaints they receive throughout their worldwide businesses. As these centers start to provide services like billing and telemarketing in addition to customer service, the contact center software industry will experience challenges from coping with enormous amounts for customer requests and data analysis. The advent of ecommerce retail has further given a remarkable boost to digital services, connecting more consumers with businesses and creating a demand for higher number of customer contact executives. In 2017, the global ecommerce retail sales amounted to about USD 2.3 trillion, out of which world’s top three e-retailers contributed nearly USD 100 billion. This includes Amazon.com, which operates 13 country-specific websites and services at least 16 countries in all, including the U.S., U.K., India, Germany, Spain, France, among others. The vast ecommerce operations of Amazon indicate the probability of customer service requests from millions of people from diverse cultures, as it sells thousands of products in each country every day. Various other local and international e-retail platforms face similar concerns, offering outstanding growth prospects for the contact center software market from hundreds of online businesses. According to statistics, there were approx. 1.66 billion digital buyers around the world in 2016, representing the extensive customer service difficulties and opportunities e-retailers have to deal with. These businesses have to cater to several requests via tele calling, email, mobile text messages as well as social media, since it is impossible for all customers to communicate with them on the same platform. Receiving requests, identifying problem areas and providing solutions to consumers across these distinct channels has defined the contact center software industry’s evolution over the years, further intensified by the growing utilization of online payment options. Over the years, technological advances have enabled wider implementation of virtual assistants and interactive voice features by retailers, allowing software makers to provide innovative solutions. The contact center software market has further benefited from the growing awareness among retailers about the role of analytics and reporting in guaranteeing improved customer experience. Managing customer-employee interaction, behavior, customer requirements have critical impact on business revenues. Speaking further on the analytics and reporting component of the contact center software industry, retailers can reduce potential loss of sales and negative consumer responses by analyzing how they are being serviced. As the time taken to handle a request, origin of the request, behavior on the call and other factors are recorded by the software, companies can use the information to train their staff better. The success or failure of email and telemarketing campaigns can also be analyzed to enhance or modify their processes, as consumer trend is key for retailers to achieve profits. Essentially the retail segment, with expanding popularity of ecommerce, is expected to contribute significant revenues towards the global contact center software market. 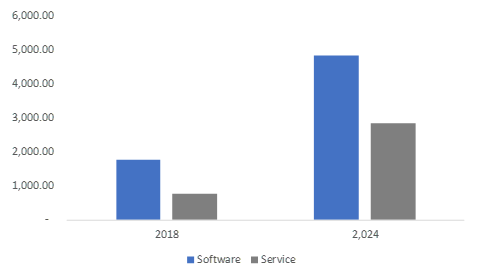 Global Market Insights, Inc., forecasts the overall contact center software industry to surpass a valuation of USD 40 billion by 2024. This entry was posted in Sustainable & Smart Technologies and tagged Automatic Call Distribution, Call Recording, Cloud, Computer Telephony Integration, Contact Center Software Market, Contact Center Software Market Share, Contact Center Software Market Size, Customer Collaboration, Dialer, Global Contact Center Software Market, Integration and Deployment, Intelligent Virtual Assistant, Interactive Voice Response, Managed Service, On-Premise, Reporting & Analytics, Support and Maintenance, Training and Consulting, Workforce Optimization.